I am little bit into videos right now. at that into this clock. I’ve seen it during the design week (the official relaunch) at rosana orlandi‘s spazio in milan. christiaan postma is a dutch designer, based in stockholm. and why describe how it works when a video can exemplify it best. 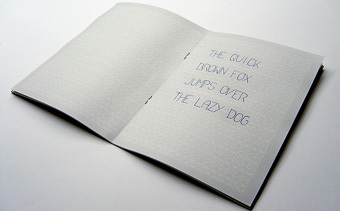 this notebook contains a simple grid so that the user is able to create individual letters himself by filling in the lines. a hand written text contains a stronger emotion than a printed because its more personal, but a hand written text is not always the most presentable. with this notebook people are able to create personal notes in a presentable way with guidance from the grid.